It made perfect sense to wrap up a month of FAB Women making history with a woman who made one of the most important pieces of recent history when she became the First FAB FLOTUS. Make the jump to read the top ten reasons why we find Mrs. O so utterly FAB! 1. Her hair. Please, please get into her always perfect hair. 2. Her toned arms and overall healthy physique. 3. Speaking of her physique, her tireless work in the fight against childhood obesity. 4. In line with her focus on health, she planted a White House garden and invited local school children to help her maintain it. 5. She dances, and dances well. 6. She makes appearances on shows that appeal to kids and teens. 7. She introduced the concept of First Grandma. 8. She is a style icon. 9. She is an excellent wife who compliments The President perfectly! 10. 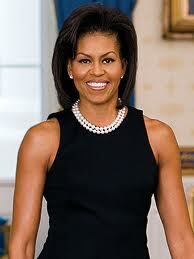 She is an excellent mother, raising the FAB Sasha and Malia! Why else is she FAB? Tell us in the comments!